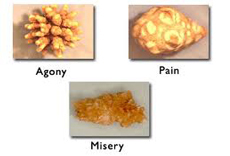 When people think about kidney stones, excruciating pain often comes to mind. When you have one, you wonder if it will pass it on its own or whether will need medical intervention. Most people pass kidney stones spontaneously, but they can be intolerable. If your kidney stones are too large and don’t pass, your doctor may use more aggressive treatment. Don’t ever try to diagnose yourself if you have severe pain or try to mask it with a painkiller. You must see a doctor to determine the source of the pain. Kidney stones develop from salt and minerals that stick together in the urine. Kidney stones are solid and can be the size of a tiny pebble or as large as a golf ball. Although they originate in the kidney, they pass out of the body through the urinary tract (which contains the ureters, bladder, and urethra). Sometimes they block the flow of urine. Urology is a medical and surgical specialty that deals with urinary tracts of males and females, and the reproductive system of males. Indian hospitals have some of the finest urologists who have valuable expertise to diagnose, treat, and manage patients with urological disorders. The organs covered by urology include the kidneys, adrenal glands, ureters, urinary bladder, urethra, and the male reproductive organs (testes, epididymis, vas deferens, seminal vesicles and prostate). Combining the latest World class technologies with the healing touch of experienced hands, SafeMedTrip affilated Hospitals bring the best -in-class patient care within your reach. Painless procedures, assured relief and a success rate that compares favourably with the best such facilities in the World. • HOLEP : Holmium Laser Enucleation of the prostate (HoLEP) is a modern alternative to the standard Transurethral Resection of the Prostate (TURP) procedure for bladder outflow obstruction due to BPH. It requires a short period of hospitalisation and an anaesthetic. A catheter (a tube which drains the bladder) is also needed for 1-2 days until the urine clears. Patients are advised to take life quietly and to avoid straining or heavy lifting for four weeks after the surgery. • TURP : Transurethral resection of the prostate (commonly known as a TURP, plural TURPs, and rarely as a transurethral prostatic resection, TUPR) is a urological operation. It is used to treat benign prostatic hyperplasia (BPH). As the name indicates, it is performed by visualizing the prostate through the urethra and removing tissue by sharp dissection. This is considered the most effective treatment for BPH. This procedure is done with spinal or general anesthetic. 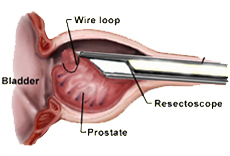 A triple lumen catheter is inserted through the urethra to irrigate and drain the bladder after the surgical procedure is complete. Outcome is considered excellent for 80-90% of BPH patients. • Uro Oncology, World class treatment for cancer of Kidney, Bladder and Prostate. • Most advanced facilities for advanced Laproscopic Urological Procedures. • High-end male and female urological reconstructive surgery. Extracorporeal Shock Wave Lithotripsy Your doctor may use a technique known as extracorporeal shock wave lithotripsy or ESWL to break up a stone. A machine outside your body delivers shock waves directly to the stone, crushing them into small parts that will be eliminated naturally through your urine. Percutaneous Nephrolithotomy(PCNL) Percutaneous (meaning through the skin) nephrolithotomy involves inserting a tube through a small incision in the skin in the back into the abdomen and kidney to help with drainage. This surgery is used when stones are too large. A fiberoptic camera called a nephroscope provides an accurate view of the stone’s location. One advantage of the procedure over ESWL is that the entire stone removal process is done at the time of surgery.